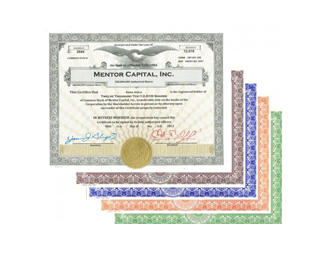 SAN DIEGO--(BUSINESS WIRE)-- Mentor Capital, Inc. (OTCQB:MNTR) announces that early shareholders who together also hold approximately 3,000,000 Series B Warrants are having the 10 cent per warrant redemption payment for those warrants voluntarily paid out now by the Company approximately one-year in advance of the May 1, 2018 date previously scheduled with the Depository Trust & Clearing Corporation (DTCC). Checks for the early redemption payout have been sent to all shareholders who previously sent in their physical Series B Warrants certificates to the Mentor for later redemption. Shareholders who now or in the future come upon a physical Series B Warrant certificate may send it in then to the Company for redemption payment. The many shareholders who have deposited their Series B Warrants with a broker will have their redemption payment processed electronically through the DTCC participant system. Series B warrants, if in a brokerage account, will be identified by CUSIP #587183183120. In the normal course, they will soon disappear and simultaneously be replaced by cash paid in a lump sum to DTCC by Mentor Capital at a rate of 10 cents per warrant. Mentor has requested that the payment be processed Tuesday, April 18, 2017, subject to DTCC final processing and approval. Mentor adds a final caution that shareholders should immediately examine their brokerage statements to ensure that over the intervening years their warrants have not been erroneously removed from their accounts. “The 10 cent Series B Warrant redemption payment represents approximately a 1000% gain from the original value turned over to Mentor on behalf of the those investors in January 2000. Paying that out a year in advance of the scheduled payment date is consistent with your management’s guiding financial goal of maximizing shareholder return. We are most pleased the Company’s strong debt-free financial position allows us to put cash directly back into the hands of our shareholders,” comments Mentor Capital, Inc. CEO, Chet Billingsley. About Mentor Capital: The Company seeks to come alongside and assist private medical marijuana and cannabis companies and their founders in meeting their liquidity and financial objectives, to add protection for investors and to help incubate private cannabis companies. Additional important information for investors is presented at: www.MentorCapital.com .